Don’t take this the wrong way, but I was pleased to see the picture of the flag-draped military coffins returning to American soil on the front page of today’s New York Times. Of course it’s beyond sad and awful and despicable and vile that our government has seen fit to put young people in harm’s way in Iraq and Afghanistan because….hmmm, tell me again exactly why we’re involved and why they’re over there?! 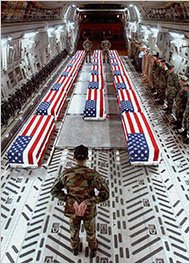 So thanks to all you military guys at the Pentagon for lifting the ban on showing us photos of those coffins and for letting us see—time and time again--the true cost of the conflicts in which we’re embroiled in those faraway lands. Now, can you please do something to bring home the rest of the young people so they can get on with the business of living the rest of their lives?